12 augusti, 2013 Säg något! So far I’m in love with Tales of Xillia! It’s everything I had hoped for and right now I don’t have any complaints. So as I thought, for me its a good candidate for Game Of The Year for me. Too be honest I’ve spent around 33hours in the game and most of them I’ve been doing sidequests and stuff. And playing around with attachments. 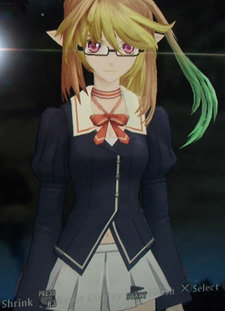 As you can see in the picture here beside I have given Milla glasses and elf ears, they really suit her. I also love it that you can get different hair styles in the game, in past Tales of games characters would only change their hair if they got a new costume to wear. Well not anymore! Sure if you get (buy) new costumes you get a new hair styles, but you can change back to the characters regular hair. So you can mix and match! I bought Millas swimsuit to get her hair in a ponytail and because it was a swimsuit. Shut up! This is something I really like and appreciate in games, I can spend hours with stuff like this to try and mix and match. As soon as I can afford I’ll get more of the DLC stuff. Damn you Namco! A bit pissed that I’ll probably never get Cress and Stahn DLC, for those who don’t know it’s the main characters of the first two Tales of games. Tales of Symphonia Chronicles. And I do really hope that in new entries in the Tales of series, will continue to use and expand upon Tales of Xillia’s attachment’s because as I said I sure do like that!